IR Sensor module has great adaptive capability of the ambient light, having a pair of infrared transmitter and the receiver tube, the infrared emitting tube to emit a certain frequency, encounters an obstacle detection direction (reflecting surface), infrared reflected back to the receiver tube receiving, after a comparator circuit processing, the green LED lights up, while the signal output will output digital signal (a low-level signal), through the potentiometer knob to adjust the detection distance, the effective distance range 2 ~ 10cm working voltage of 3.3V-5V. The detection range of the sensor can be adjusted by the potentiometer, with little interference, easy to assemble, easy to use features, can be widely used robot obstacle avoidance, obstacle avoidance car assembly line count and black-and-white line tracking and many other occasions. the sensor active infrared reflection detection, target reflectivity and shape of the detection distance of the key. The black minimum detection range, white maximum; small area object distance is small, a large area from the large. 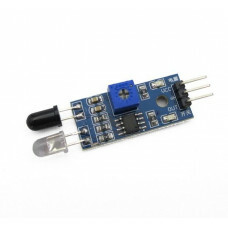 The sensor module output port OUT can be directly connected with the microcontroller IO port can also be driven directly to a 5V relay; Connection: VCC-VCC; GND-GND; OUT-IO. The comparator using LM393, stable. 3-5V DC power supply module can be used. When the power is turned on, the red power LED is lit. With the screw holes of 3mm, easy to install. Board size: 3.1CM * 1.5CM. Each module in the delivery has threshold comparator voltage adjustable via potentiometer, special circumstances, please do not adjust the potentiometer.